You may or may not be aware by now that the other team in the state has a football game tonight. The importance of the game is, well, not important, but you should also know they are playing the Notre Dame Fighting Irish. The sports world is generally torn over the Irish. On one side, you have Catholics that pull for the team based on their religious faith alone, as well as those that worship them as the Yankees or Lakers of college football. On the other side, you have those that hate them just for their “royalty,” but for the most part, those that don’t like them have just grown tired of the Irish getting credit and publicity in the last two decades — when they’ve done nothing — just for their history. I’m generally in that last group, but the difference is that I don’t really mind Notre Dame when they are actually good. I don’t like that they are in the BCS basically as their own conference, again, just based on their history, but if they are holding their own, I have no issue with them. I mean, who doesn’t love Rudy? Shutup, you all love Rudy. Rudy makes us all try harder. When Auburn played Oregon in the 2010 National Championship Game, a good many Alabama fans spent their hard-earned money to buy shirts, buttons, and stickers that said things like “Roll Ducks Roll.” The sentiment of wanting Oregon to win was fine because Auburn is Alabama’s rival (even though they said Auburn fans should have pulled for the Tide against Texas the year before), but most Auburn fans ridiculed the fans that wasted money on a shirt that would only be relevant for a week, and then just plain pointless after Auburn won the game. Then someone made the logo above (which I love just because it looks awesome, and has nothing to do with the game), put it on a t-shirt, and now some Auburn fans are doing the same thing that Alabama fans were made fun of for doing just two year ago. So of course, on Twitter and Facebook you see the same arguments going on that went on in 2010. But fear not, Auburn fans. Your desire for an Irish victory has deep-rooted reasoning. It’s backed with history and tradition. Forget the opponent. It means nothing in this case (and really all cases). From 1930 to 1950 Auburn had four football coaches, and three of those four coaches were former Notre Dame football players. Chet Wynne played at Notre Dame from 1919-1921. He then coached at Auburn from 1930 to 1933 with a 22-15-2 overall record. His final season would be the first season of the SEC, in which Auburn was a founding member. Wynne was also the man that gave Shug Jordan his first job out of college, at Auburn, beginning his coaching career. Jack Meagher played at Notre Dame in 1918. 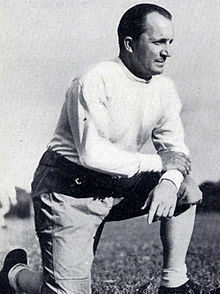 He then coached at Auburn from 1934 to 1942 with a 48-37-10 overall record. Meagher took Auburn to their first bowl game and was responsible for the plan to build Auburn Stadium, now Jordan-Hare Stadium. I have been unable to find a picture, but I trust Mr. Housel. And you go crazy over a stripe change on pants? Auburn wore green jerseys to honor Notre Dame one year. You pull for the Irish all you want tonight. All you want. Earl Brown played football and basketball at Notre Dame from 1936 to 1938. He then coached at Auburn from 1948 to 1950 with a 3-22-4 overall record. Brown went 0-10 in his final season. Yikes. We gave him a third year after only winning three total the prior two? I was able to find a newspaper article on the hiring of Brown from the MIAMI news talking about new AUBURN coach and his NOTRE DAME playing career. I mean, come on. This is deep-rooted. It doesn’t stop there. Have you taken the time to listen to the opening phrase of “War Eagle?” Sure you have. Now listen to the main phrase of the Notre Dame fight song (the part that goes “Cheer, cheer for old Notre Dame). That’s the exact same rhythm, isn’t it? Try it. Sing “War Eagle, fly down the field. Ever to conquer, never to yield,” and then “Cheer, cheer for old Notre Dame. Wake up the echoes cheering her name.” Mind-blowing, huh? If you’re musically challenged, just trust me. It’s the same. According to Auburn’s Director of Bands, Rick Good, the composer of “War Eagle,” Robert Allen, wrote the first line with influence from the Notre Dame fight song. It was done on purpose. The schools are linked. I don’t know what else I have to tell you. Pull for the Irish tonight, and don’t think twice. You pull for Auburn because they are Auburn. You don’t pull for Auburn because they play against Alabama. Now, with this history, with these connections, you can pull for Notre Dame because they are Notre Dame. And it has absolutely nothing to do with Alabama. Go Irish… unless they’re playing Auburn. War Blogler a closet Bamer? What has the world come to? I am struggling with this game. I hate Notre Dame for many of the reasons you mentioned above. I hate Alabama for all the obvious reasons. But I’m a southerner, an SEC man, I usually pull for all SEC teams in bowl games except Alabama. But it’s Notre Dame. How can I pull for Notre Dame? This is causing a rift in my marriage. We are both AU grads (’00, ’01) but she did not grow up an SEC fan. I want Alabama to lose, but I don’t want Notre Dame to win. The media coverage would be insufferable. It’s going to be a terrible night no matter the outcome, so why not just pull for the SEC to continue it’s dominance? I have the same problem when UAT plays UGA, though this happens rarely (and could someone explain the WHY of that, please?). Especially the part about poisoning our oaks. That snaps me back to reality–I saw them last week and it is gut-wrenching. 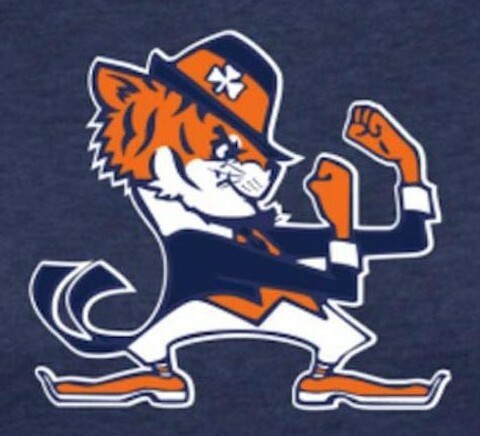 I’m an Auburn grad (’86) but I started pulling for Notre Dame, in addition to Auburn, in September. I’m of Irish descent. Additionally, I tore my ACL is a sparring (fighting) session in early September. Thus, I feel a bond with the Fighting Irish. How could I NOT pull for Notre Dame?! I am a Bama fan –not the obnoxious kind. I have a lot of AU friends and during the regular season, I was happy for them to enjoy their wins. I wanted AU to beat the Ducks. I was proud that the state of AL had a BCS champion in Auburn. Was prouder for Alabama at her BCS championships. I found the “ties” of AU to ND interesting. However, I suggest that both state pride, and SEC loyalty should trump loooong ago coaching ties to ND. BTW, my high school Alam Mater song was to tune of an Elivis song. That did not make me an Elvis fan. I’m the “someone” that designed the War Irish mascot. Thanks so much for the kind words! Sorry, I am a Southerner first. I grew up in Florida in the FSU backyard, so 90% of my hatred is for the gators (not worth capitalizing). that is especially true now that I live in Jacksonville — too close to the swamp for comfort. I am an AU alum, and bleed burnt orange and navy, but I am a Southerner from birth. I am no fan of bama, and when they play the gators, I cheer for nuclear fallout or a terrorist attack. (kidding…sort of). Bama gets about 2% of my hate, and other 8% is reserved for Ohio State, Southern Cal, Notre Dame, Michigan, and all other pretenders who think they play real football. The point is, I will always pull for the SEC in national title games. I never thought that I would ever want the gators to win in anything, until I watched their title game against Ohio State. The Buckeye people and media kept saying THE Ohio State university, and continued dissing the SEC, and by extension, the South. So while I never uttered “go gators,” I was happy to see the snooty yankees get theirs. Same thing with Bama. I can’t ever bring myself to say “roll tide” but I sure was glad to see Forrest Gump kick Rudy’s booty. I hated that movie, by the way. Last night I proudly wore my “Kiss me I’m Irish” t-shirt while watching the game. While I can’t get excited about Bama now claiming 32 National Championships, I did enjoy the overrated Fighting Irish get put in their place along with the sports writers and commentators who always put the Irish 5 or 10 rungs higher up the ladder than they belong. Also, Miss Alabama USA is NOT all that. Not sure what the fuss is all about. She’s somewhat pretty. Nothing more. Norhing more? She’s an Auburn grad! That’s a whole lot more! haha!